Susan has horses in her blood and she thanks her Plains Cree Ancestry for that gift. As far back as she can remember she has loved horses and all animals. Susan is an avid rider, horse trainer, and can often be found just being with her herd. In 1989 Susan graduated from the University of Alberta with her Bachelors in Education and her Masters level in Academic and Vocational Assessments and Individualizing Curriculum. In 1990 Susan discovered another passion, Personality Types. She has read many, many books on the topic, pursued extensive professional training and professional credentials on the subject, and has since applied that positive learning daily in her life and her business. Knowing her personality type and other peoples’ personality types gave her a platform to understanding and valuing them in their own unique and positive way. In her classroom teaching career, Susan taught grades 1 to 11 in Alberta, British Columbia and Nova Scotia where she used personality type understanding to individualize her curriculum to best meet the needs of each student. Susan also taught Social Education Skills to all her students which helped in building their social-emotional skills, as well as building their relationship skills and overall personal life skills. Her classrooms were magical spaces where everyone was valued, appreciated and excelled. In 1995 Susan opened her first consulting business and has taught her classroom management techniques with teachers throughout British Columbia with great success. In 1999 Susan and her family moved from the west coast of Canada to the east coast where they bought a small farm in the Annapolis valley in very rural Nova Scotia. Here she found a peaceful place to raise her children and finally have her horses in her own backyard! Susan spent many wonderful hours caring for, watching and learning more about the magic of horses. Horses have always brought Susan an overwhelming sense of peace and calm in her hectic and demanding life. Susan continued to expand her consulting business where the effectiveness of teaching social-emotional skills and virtues helped with the harmful issue of bullying. Over the course of 5 years, Susan developed her classroom methods to include classroom resources and a program for schools and teachers to follow. Susan taught her Social Education Skills program in well over 250 First Nation and Inuit schools in Canada. Susan has designed 15 other wellness workshops which are facilitated all over Canada. Susan Buchanan Education Group has facilitated wellness-based workshops in over 400 communities in Canada and the United States. Susan has also trained inDrW.Glasser’s Choice Theory, Dalhousie University’sApplied Suicide Intervention SkillsTraining, she is a certified Life Skills Coach and holds a Counseling Certificate from the University of Dalhousie. In 2017 Susan was honoured with two awards, Business Woman of the Year from Nishanawbe Aski Nation Development FundandFearless Woman of the year in business and in helping others. Susan was also nominated for the Order of Nova Scotia. Throughout her adult life, Susan had been wanting to combine her love of horses and her passion for helping others. 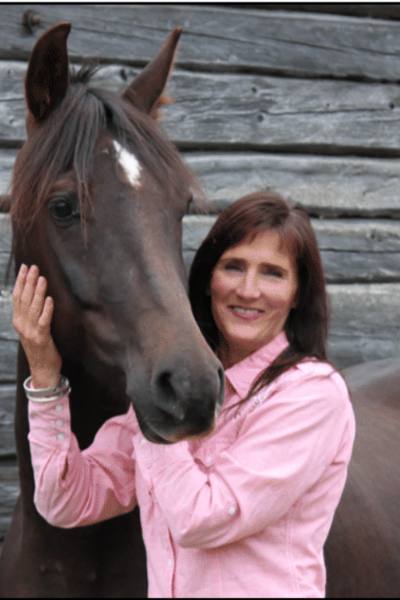 In 2018 Susan graduated from the facilitated Equine Experiential Learning(FEEL) Program with the registered trade mark program and knew it was the avenue she wanted to pursue and share with others. Susan is now combining all of her education, training and experiences and co-partnering with her horses. Together they would like to share the gentle transformative power horses have to act like a mirror to teach us about living as our authentic selves. Susan looks forward to a positive and rewarding relationship with Hooves Helping Hearts. A sacred space of possibilities will be created for all participants where they will learn how to create harmony and balance in their lives by aligning their mind, body and spirit. Come and experience the gift of horses with Hooves Helping Hearts.